More the 45,000 content items (apps and games) have now been published in the Windows Phone Marketplace and the rate at which applications are being added continues to accelerate. Last week saw more than 2,000 applications added to the Marketplace, although this is likely to be an outlier (the average for the preceding 8 weeks was 1177 items). At the time of writing, 45,610 items have been published. Of these, 14,261 were added in the last 90 days and 5,837 were added in the last 30 days. These items come from 11,995 different publishers. The Windows Phone Marketplace passed the 40,000 mark in the middle of November, it has taken around 26 days to add the next 5,000 apps. Updating our previous prediction we now estimate, that if current trends continues, the Marketplace will reach the 50,000 app mark in the first week of January 2012. However, it is possible that this mark may be reached before the end of the year if submission rates accelerate. We'll report in more detail and provide some additional statistics when the 50,000 item mark is reached, as we did for the 40,000 item mark. If you're interested in getting additional details sooner, please get in touch and ask about the AAWP App Tracking service. The graph below shows the growth in the total number of applications published to the Windows Phone Marketplace over the last year. 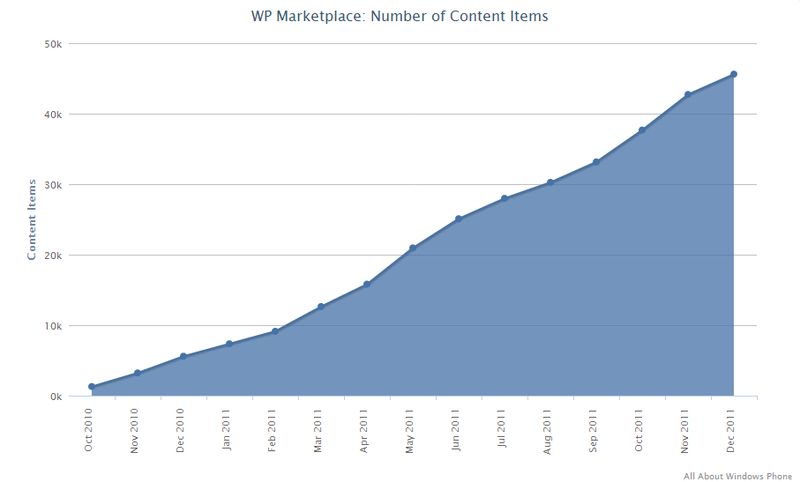 Growth of Windows Phone Marketplace. Note: December 2011 is not complete. Figures up to December 11th. 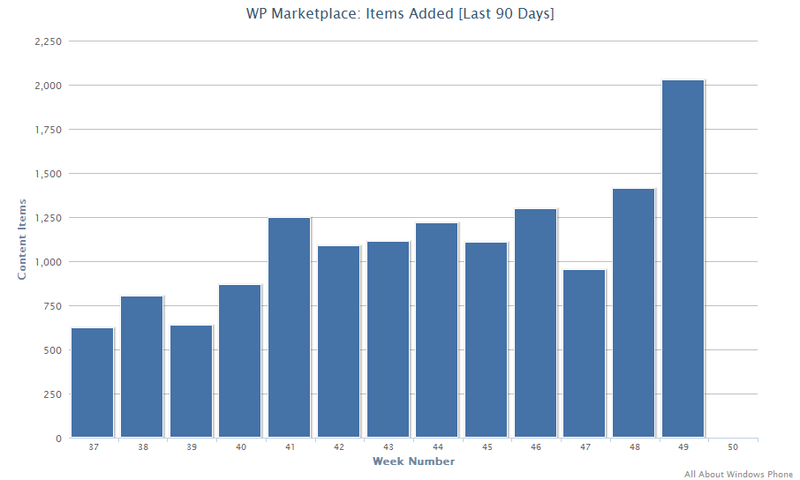 The graph below shows the number of content items add to the Windows Phone Marketplace each week for the last 3 months. Windows Phone Marketplace passes 35,000 apps - where we also made a comparison with the first year of competing app stores.